Landscape plans are drawings that illustrate how an area will appear once plants, fencing and additional items are installed or planted in a given space. They often show black lines on white paper---difficult to interpret if you have no prior experience with landscaping. To fully understand a landscape plan, understand the symbols and drawings, as each has its own meaning. Identify the buildings on the landscape plan. If the plan is for your backyard or front yard, your house will be part of the drawing to indicate the direction and location of your yards. Buildings such as houses or sheds are often large rectangles drawn to reflect each construction's shape. Look for fences on the landscape plan. Fences are usually drawn as two parallel lines, either around the property or partially around the home, depending on the location of the fence. Identify the walks on the landscape plan. Walks are drawn based on the materials used to build them. For example, concrete walks are rectangular squares, so a driveway would be a large square. Brick walk ways are small random squares, while flagstones or cobblestones are circular and rectangular shapes. Small dots indicate that a walkway is made of asphalt. Locate general orientation symbols that indicate the direction of north and south, for example, or indicate the general direction of wind or sunshine. These orientation symbols are often drawn with a letter to indicate the orientation along with an arrow in the appropriate direction. Look for utilities on the landscape plan. Although utilities are not necessarily part of a landscape, the placement of the utility outlets can prevent the planting of trees or shrubs, so you can access the utility boxes. Utilities are shown as letters and common utilities include telephone (T), electricity (E), sewer (S), water (W) and utility poles (UP). Locate the lines that have a number attached to them. These lines can be straight or curvy and stippled or solid. Each line will have a number with a measurement beside it. The measurement can be feet or inches. Look for a large area with wavy lines drawn inside of it. These waves indicate water, such as a pond or a pool. Notice circles with a small dot in the middle. These circles indicate trees on the landscape plan. If the tree is an evergreen, the circle will have jagged lines that meet in the middle. 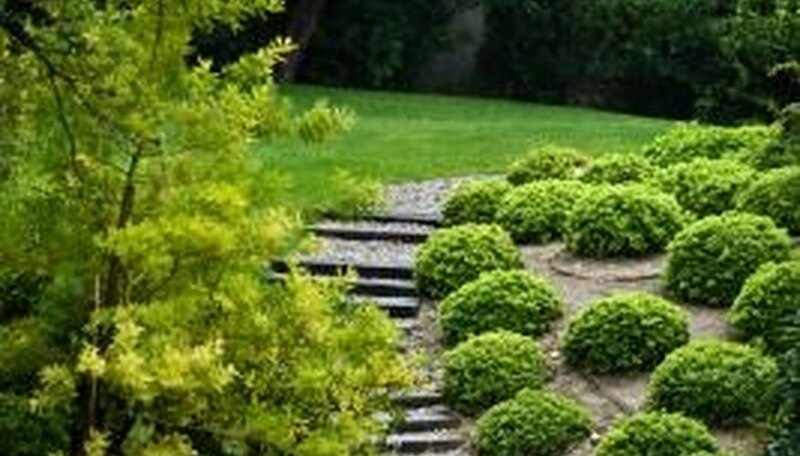 Shrubs are smaller circles placed side by side with a randomly waved perimeter. Flower beds are drawn in random shapes as they can be designed and implemented in a yard as desired.